The United States’ president, Donald Trump’s daughter, and White House advisor too, Ivanka is visiting Ethiopia. She arrived in Ethiopia on Sunday and met with senior government officials including Prime Minister Abiy Ahmed and President SahleWork Zewde on Monday. She also visited Kidist Selassie Menbere Tsebaot (Holy Trinity Cathedral) where she met with Bishops and laid a wreath to mourn victims of Ethiopian Airlines plane ET302 which crashed shortly after takeoff from Bole International Airport. Her discussion with President Sahlework Zewde focused on works that are being done by the government to ensure that women have equality to opportunity. Ethiopian state media, EBC, cited her as saying that her father’s administration has unveiled an initiative that is said to make more than fifty million women, around the world, beneficiaries. The visit to Ethiopia is related to the works of the project. Its program focuses on women capacity building, job creation and encouraging governments to come up with legislation and laws to ensure women’s participation in the economy and equal opportunity. Cote d’Ivoire, West African country, is Ivanka’s next stop in the continent. Last year, Ethiopia introduced gender parity cabinet which is said to the first in the continent of Africa. Among other positions, the president of the country, Chief Justice and Chair of Ethiopia’s election board are women. 4 Responses to "Ivanka Trump discuss women rights during her visit to Ethiopia"
Ethiopia is a Rising State and Nation!!! it is reported that majority of the monthly salaries in Ethiopia range from $35 to $40 per month OR 1,000 BIRR TO 1,150 BIRR PER MONTH . On the other hand, it is reported that majority of the monthly salaries in Ethiopia range from $35USD to $40USD per month OR 1,000 BIRR TO 1,150 BIRR PER MONTH . we should rise against corruptiona and nepotism and most importantly against ethnic based violence in order to tackle the rise of displacement and its consequences . 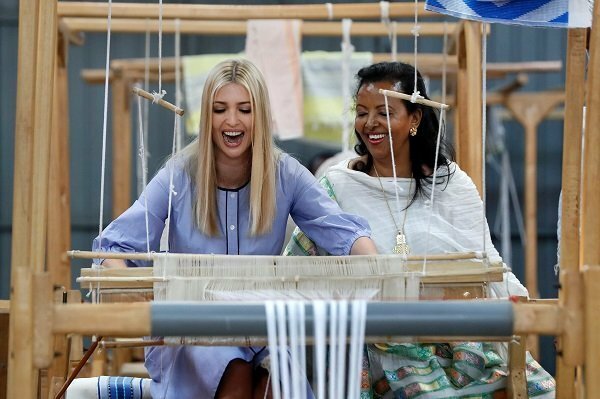 I would like to thank Ivanka Trump for coming to Ethiopia, the first country she visited in Africa. Most of all it is remarkable how decently and beautifully she was dressed up when she met with our President. Thank you again for respecting our country and our President. You are cordially invited to come back again.. .